Philip I, the Handsome, King of Spain, son of the emperor Maximilian I, and husband of Joanna the Mad, daughter of Ferdinand and Isabella, was the founder of the Habsburg dynasty in Spain, and was born at Bruges on the 22nd of July 1478. In 1482 he succeeded to the Burgundian possessions of his mother Mary, daughter of Charles the Bold, under the guardianship of his father. In 1496 he married Joanna. The marriage was one of a set of family alliances with Austria and Portugal designed to strengthen Spain against France. The death of John, the only son of Ferdinand and Isabella, opened the succession to the Spanish Crown to Joanna. In 1502 she and her husband received the homage of the cortes of Castile and of Aragon as heirs. 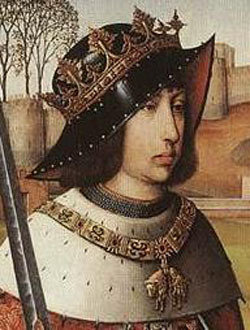 Philip returned to Flanders before the close of the year. His life with Joanna was rendered extremely unhappy by his infidelity and by her jealousy, which, working on a neurotic temperament, precipitated her insanity. The princess gave way to paroxysms of rage, in which she was guilty of acts of atrocious violence. Before her mother's death, in 1504, she was unquestionably quite insane, and husband and wife lived apart. When Isabella died, Ferdinand endeavored to lay hands on the regency of Castile, but the nobles, who disliked and feared him, forced him to withdraw. Philip was summoned to Spain, where he was recognized as king. He landed, with his wife, at Corunna on the 28th of April 1506, accompanied by a body of German mercenaries. Father and son-in-law had interviews at Remesal, near Pueblo de Senabria, and at Renedo, the only result of which was an indecent family quarrel, in which Ferdinand professed to defend the interests of his daughter, who he said was imprisoned by her husband. A civil war would probably have broken out between them; but Philip, who had only been in Spain long enough to prove his incapacity, died suddenly at Burgos, apparently of typhoid fever, on the 25th of September 1506. His wife refused for long to allow his body to be buried or to part from it. Philip was the father of the emperors Charles V and Ferdinand I.